Interactive and playful installation for the Pop Up Culture program promoted by Guimarães 2012 – European Capital of Culture. Until the 16th of November at Plataforma das Artes, Guimarães, Portugal. Based on the principle of swinging to produce electricity, SWING is also an ode to the rich industrial heritage of Guimarães, reflected in its mechanical devices and sounds evocative of the ones once produced in the factories of the city. 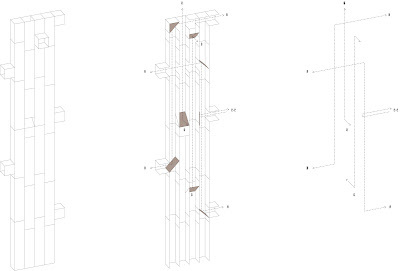 The base structure, made of re-usable wooden pallets (sponsored by Palsystems), serves as a podium for the swings at the same time that it contains the hidden electrical system. Traditional hemp rope, wooden beams, bicycle chains, wheels, dynamos and lights complete the material palette used in the installation giving it an “old-style” look and a low-tech kind of feel. Sponsor: Palsystems – Paletes e embalagens, Lda. PIRILAMPOS was one of the selected atristic projects for the Festival „Serralves em Festa 2010” in Porto, Portugal. Pirilampos is a installation/ performance which plays with an imaginary world of glow flies. People were following the royal “Pirilampos caravan” and were invited to settle out all the colour lighting glow flies in the Serralves Park. The PERISKOP MORADAVAGA is an installation made for the art festival „el globo de juan“ at Velha-a-branca that took place in Braga, Portugal on the 6th and 7th of June 2009. The PERISKOP was designed to occupy the center of the main stair of the building, between the ground floor and the top floor. 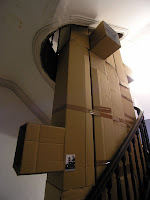 The object is made of recycled cardboard and includes different periscope views between the house levels. Some videos about Moradavaga’s recent works were also shown at the exhibition. The success of the PERISKOP at the festival was such that the period for visiting was extended until the end of June! Taking advantage of the windows of an empty apartment, Miragens was a back projection party that happened in Porto, Portugal. It featured works by Baldo Mero, DPpP, Marta Canas, Jorge Lapa, Kazé, Rui Santos Vieira, Rui Baptista, Sérgio Guerra, Eva Sousa, Pedro Cavaco Leitão. Many thanks to Pedro Durães Leite, Paulo Maia, Miguel Ferraz/IPJ, and all the artists. A Zoo is a prison for the animals. They’re incarcerated, away from their natural environment, and at the disposal of human beings. 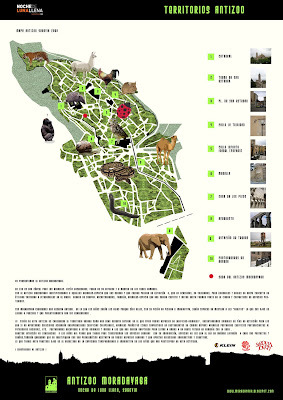 With MORADAVAGA’s ANTIZOO we will identify those “animals-spaces” that surrounds us and are in danger of extinction or that, for one reason or the other, we don’t seem to value at a given time, to liberate them and invest them with a new concept of utility for Segovia, integrating them in the city’s urban tissue. We’ll also be finding “animals-spaces” that have adapted and coexisted with Segovia’s many changes and evolutions throughout history, and that have become protected species. Together with MORADAVAGA we will create a Natural Park in which children will act as our guides, for only them, with their unpolluted and imaginative vision, will be capable of showing grownups what their eyes have been missing and, because of that, abandoning and letting rot. 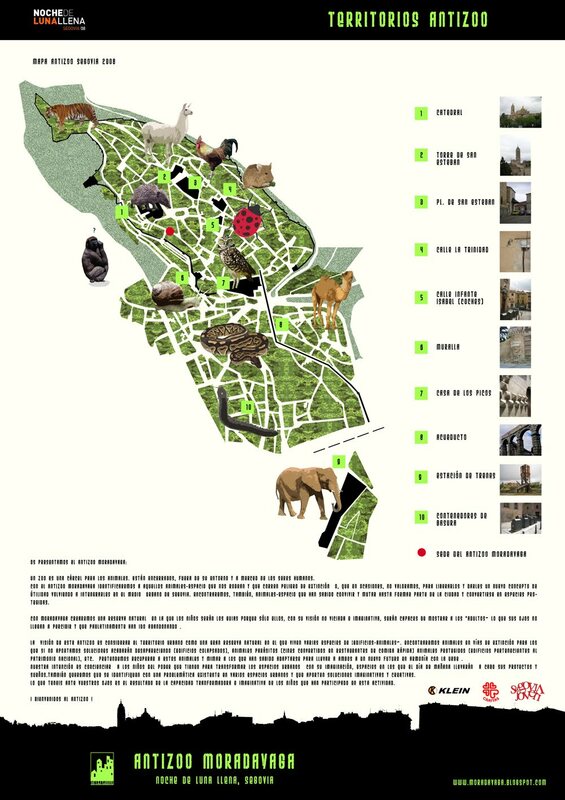 This ANTIZOO’s sees the urban territory as a big Natural Park inside of which there are many different species of “animals-spaces”. Here we can find animals in danger of extinction (ruined and abandoned buildings), for which we must find solutions, otherwise they will disappear, parasite animals (like theatres converted into fast food restaurants), protected animals (national and world heritage buildings), etcetera. 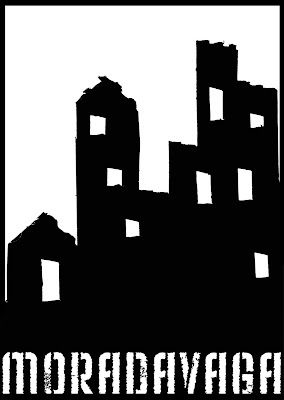 Our goal is to recover the endangered animals and mime the ones that have been capable of surviving in the city so that they can all find a harmonious future in the urban territory. Our aim is to make children aware of their own power to transform the urban spaces with their imagination, since tomorrow these spaces will be the ones in which they will carry out their own projects and dreams. We also want for them to identify the different problematics that affect various urban spaces and that they try to come up with imaginative and creative solutions. What you have in front of your eyes it’s the result of the transforming and imaginative capacity of the children that have participated in this activity. - two A3 sheets containing a small text with a short description of the idea and its function, the reasons for the choice of the place, the explanation of the construction aspects and/or the necessary means to implement the Project, and a graphic representation of the proposal making it possible to compare beetween the “before” and the “during”/”after” of the intervention (weather an activity or an object). For those who were not familiar with the city of Porto, it was possible to find information about some places that could be interesting to work over in the competition’s internet site. Fourteen projects by authors from five countries (Austria, Brazil, Germany, Italy and Portugal) were submitted. Comprising a wide variety of themes and different levels of complexity the proposals ranged from the most simple of gestures to the most utopian of views. After the period for submission ended, all the proposals saw their way into a catalogue besides being published on the competition’s internet site. Moradavaga would like to thank all the participants as well as all those who helped in the realization of this competition. 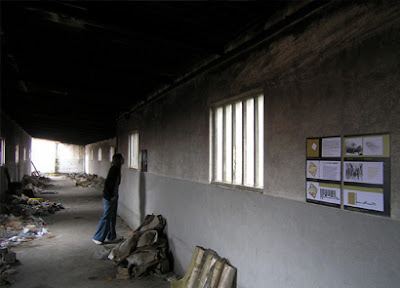 “Moradavaga at Fábrica Social” was a one-day event that took place on the 16th of June 2007, in and around the buildings of an old derelict factory in Porto called Fábrica Social (Social Factory). With a program that included the viewing and discussion of three short movies by the collective OSU (Ocupa Sensibiliza Utiliza) and a picnic, in addition to the exhibition of the works of the participants in the Ideas Competition launched by Moradavaga in April 2007, only the rain was able to reduce a little bit the success of the event. In spite of the weather, about 50 persons came to the premises of FÁBRICA SOCIAL on the day of the event. Those who were courageous enough to “tackle” the wind and the rain that fell that afternoon were able to wander around the semi-abandoned spaces of the old factory seeing the presented works as well as watching the movies that were screened in an improvised auditorium. Moradavaga would like to express its gratitude to all those who participated and helped in the exhibition as well as to those who resisted to the heavy rain and came to see it! Josseline Engeler im Interview zu ihrem Projekt "Ficar"
Die deutsche Kunststudentin Josseline Engeler realisierte ihr Projekt "Ficar" im Zeitraum 2006/ 2007 in Porto. Das Projekt ( mit welchem sie bei "Moradavaga Porto ´07" mitmachte) ist an einer Hausfassade in der Rua Dom Joao IV in Porto zu sehen. Ein Gespräch mit der jungen Künstlerin gibt uns einen tieferen Einblick in ihre Arbeit. Interview with Josseline Engeler about her project "Ficar"
The german student of Fine Arts Josseline Engeler realised her project "Ficar" during the year 2006/ 2007 in Porto. This project (with which she made part at "Moradavaga Porto ´07") is possible to see on a house facade at the Rua Dom Joao IV in Porto. A conversation with this young artist will give us an deeper overview about her work. MV - Wie kam die Idee zu deinem Projekt „Ficar“? JE - Als ich im September 2006 nach Porto kam, um dort für ein Jahr zu studieren, war ich sehr beeindruckt von den mit Azulejos verzierten Fassaden der Häuser. Da mein Studienschwerpunkt im Bereich Keramik liegt, war es für mich besonders schön zu sehen, dass auch heutzutage noch eine keramische Tradition das Bild einer Stadt ganz entscheidend prägt. Doch leider fielen mir auch sehr schnell die Lücken in diesem Stadtbild auf. Sehr viele „Azulejos“ werden entweder gestohlen oder fallen von selber altersschwach auf die Gehsteige. So entstand bereits bevor ich das Haus in der Rua de Dom Joao IV. 617 überhaupt kannte die Idee, diese Lücken mit eigenen Fliesen zu füllen und Street Art in einer ungewöhnlich konstruktiven Form zu betreiben. MV - What is the origin of the project „Ficar"? JE - When I came to Porto in September 2006 one of the first things I noticed were the facades with the famous „Azulejos“. As the main interest in my studies is ceramics I was especially pleased to see an old ceramical tradition being mainly involved in creating the townscape. But unfortunately I also became aware of all the gaps in this townscape. Many of the „Azulejos“ had been stolen or were fallen down decrepitely. This was when the idea to fill these gaps with my own tiles and do an unusually constructive street-art-project was coming to my mind, even before I got to know the house in Rua de Dom Joao IV. 617. MV - Gibt es einen Hintergrund zum Projekt und wer ist darin dargestellt? JE - Es war ein ausgesprochen glücklicher Zufall, dass an der Fassade des Hauses in der Rua de Dom Joao IV. 617, in das ich später selber einzog, 15 Originalfliesen fehlten. Konkreter wurde das Projekt als ich mich mit den Unterschieden zwischen der traditionellen Bauweise des Hauses und der Beschaffenheit seiner Bewohner auseinandersetzte. Bei den meisten der Hausbewohner handelte es sich nicht um Portugiesen, sondern wie auch in meinem Falle um junge Menschen aus dem europäischen Ausland, die für kurze Zeit zum Studieren oder Arbeiten nach Porto gekommen waren. Ich assoziierte die Veränderung der Stadt, die sich im wahrsten Sinne des Wortes von ihren alten Traditionen lösen muß, mit der Veränderung ihrer Bewohner. So entstand vor dem Hintergrund dieser schnelllebigen und globalisierten Zeit die Idee, das Innen und Außen des Hauses miteinander zu verbinden. Dadurch, dass ich die Bewohner im Stil der Street Art, auf schwarz-weiß reduziert, porträtiert habe, die Fliesen aber dennoch nach alter Tradition von Hand glasiert und gebrannt habe, versuchte ich alt und neu zusammenzuführen und den portugiesischen „Azulejos“ beim Überdauern in eine neue Zeit hinein zu helfen. MV - Is there a special background to the project and who is it representing? JE - It was a very lucky chance that there were 15 tiles missing on the facade of the house in Rua de Dom Joao IV. 617, in which I moved in later on. The project assumed concrete forms when I took interest in the differences between the houses' traditional style and the nature of it's inhabitants. Most of the housemembers were young foreigners, who had been coming to Porto to study or do an internship. I associated the transformation of the city, which had to free itself literally from it's old traditions, with the transformation of these young people. In that way the idea of connecting the out- and the inside of the house came into being. By portraiting the people in the street-art's black and white style on the one hand, but glazing and cooking the tiles in the old traditional way on the other hand I tried to bring old and new together and help the portuguese „Azulejos“ surviving into a new time. MV - In welchem Zeitraum wurden die Fliesen angefertigt? JE - Angefangen bei der Recherche, der Entwicklung der richtigen Glasur, dem tatsächlichen Anfertigen, dem Bemalen, Brennen und letztendlich Anbringen habe ich ein Jahr lang an dem Projekt gearbeitet. MV- How long did it take to finish the project? JE - Beginning with the research, development of glazes, actual production, painting, cooking and finally the fixing on the wall it took me one year to finish the project. MV - Gab es Schwierigkeiten? JE - Bei der Entwicklung der Glasur gab es einige Schwierigkeiten, da Schwarz als Glasurfarbe für Azulejos in diesem Ausmaß traditionell nicht angewandt wurde und ich mehrere Anläufe brauchte um die richtige Glasur und die passenden Fliesen zu finden. Einige der Fliesen mussten bis zu 6 Mal gebrannt werden, da die Glasur in den detaillierten Partien der Motive nicht zufriedenstellend deckte. Doch im Großen und Ganzen verlief die Realisation des Projektes gut. Durch die unumgängliche Langsamkeit der keramischen Prozesse, z.B. Glasurentwicklung und Brennvorgänge, habe ich gelernt gründlich und bedacht zu arbeiten. MV - Were there difficulties? JE - While developing the glaze there were some difficulties occuring, because black is none of the traditional glaze-colours of „Azulejos“ and it took me some time to find the right ingredients and the right type of tiles. Some of the tiles had to be burnt six times, because detailed parts of the paintings had'nt been covering enough. But all together the project's realisation went very well. According to the unavoidable slowness of ceramical processes I learned about the importance of a thorough and careful way of working. MV - Wie waren die Reaktionen auf dein Projekt? JE - Was mich besonders freut ist, dass das Projekt offensichtlich so auffällig ist, dass kaum ein Passant vorübergeht, ohne zumindest kurz den Kopf zu wenden. Grundsätzlich reagierten junge Leute positiv und auch meine Professoren in Deutschland fanden das Projekt sehr interessant und haben mich bestärkt weiterhin in diese Richtung zu arbeiten. Obwohl es auch positive und neugierige Reaktionen von Passanten gibt, scheinen jedoch gerade ältere portugiesische Herrschaften eher irritiert zu sein und sie zum Nachdenken anzuregen. MV - What are the reactions to your project like? JE - What really makes me very happy is that the project actually seems to attract as much attention as nearly nobody passes by without turning his head shortly. In general young people react positively to the project and my professors in Germany find the project to be very interesting and supported me to keep on working in this direction. Even though there are loads of positive and curious reactions especially elderly portuguese people seem to be irritated and forced to think about it. MV - Wie siehst du dein Projekt im Bezug zur portugiesischen „Azulejos“ Tradition? JE - Die „Azulejos“ Tradition hat mich tief beeindruckt. Gerade als keramische Künstlerin freut es mich Keramik als Bestandteil des Alltags zu erleben. Wie ich oben schon erwähnte, möchte ich diese Tradition durch meine modernere Herangehensweise nicht beleidigen, sondern drücke vielmehr meine Wertschätzung und meinen Respekt gegenüber dieser Tradition aus. Dementsprechend würde ich auch nie vorhandene originale „Azulejos“ durch meine neuartigen Fliesen ersetzen, sondern reagiere immer nur dann, wenn der Verfall bereits stattgefunden hat. MV - What do you think about the relation between your project and the portuguese tradition of "Azulejos"? JE - The „Azulejos“ impressed me very deeply. Especially as a ceramical artist it pleases me to see ceramics as a part of everyday's life. As I already said further above, I don't want to offend this tradition with my modern attitude, but to express my appreciation of it. Corresponding to this appreciation I would never replace existing original „Azulejos“ with my modern ones. I only react when dilapidation already took place. MV - Wird das Projekt weitergehen und wenn ja in welcher Form und wo? JE - Das Projekt „Ficar“ ist für mich beendet, doch ein neues Projekt befindet sich in der Planung. Ich möchte mich aber diesmal mehr auf die industrielle Fertigung der Azulejos beziehen. Es handelt sich bei den meisten an den Häuserfassaden angebrachten „Azulejos“ ja keineswegs um handbemalte, sondern in alten Fliesenfabriken seriell bedruckte „Azulejos“. Ich beschäftige mich daher gerade mit keramischen Siebdruck und möchte später in dieser Technik hergestellte Fliesen in ganz Porto als Street Art-Projekt immer dort, wo die originalen „Azulejos“ fehlen, einsetzen. So löse mich also konzeptuell von einem einzigen Bestimmungsort, wodurch sich auch die Motivwahl in eine abstraktere und reproduzierbarere Richtung verändern wird. MV - Will the project be extended? In which way and where would this be? JE - The project „Ficar“itself is finished, but a new project is already planned. This time I want to refer more to the industrial production of „Azulejos“. Most of the „Azulejos“ on the walls aren't handpainted but printed in the old portuguese tile-fabrics. For this reason I'm working in ceramical silk screen printing now to produce new tiles, which are supposed to be fixed onto the walls of Porto wherever there are original tiles missing. In this way I let go of one single destination for my tiles, which also changes the motives to a more abstract and reproducable direction. MV - Was hast du aus diesem Projekt persönlich mitgenommen? JE - Abgesehen von einer tiefen Auseinandersetzung mit einer mir bis dahin fremden Tradition hat mir das Projekt „Ficar“ es ermöglicht, mit meiner Umgebung, den Menschen und aber auch der Stadt selbst auf eine Weise in Kontakt zu treten, die ich vor allem im Hinblick auf die Kürze meines Aufenthaltes als ungewöhnlich intensiv und intim empfunden habe. MV - How could you personally profit by doing this project? JE - Apart from a deep examination with a tradition I didn't know until then the project "Ficar" made itpossible for me to get into contact with my environment, the people and of course the city itself in a very intensive and intimate way, that is very unusual especially as I haven't been in Portugal for a long period of time. JE - Gerade in einem Land wie Portugal, in dem es viele dieser „ moradas vagas“ gibt und in dem die Spuren der Vergänglichkeit allgegenwärtig sind, finde ich es wichtig sich mit diesen Orten auseinanderzusetzen und sie wiederzubeleben. Dass dies‘ im Rahmen von „Moradavaga“ auf eine kreative und nicht auf eine industrielle Art und Weise geschieht, freut mich als Künstlerin natürlich besonders. Da ich denke, dass es durchaus auch diese Spuren des Verfalls sind, die den Charme einer Stadt, bzw. eines ganzen Landes prägen, ist ein behutsames Eingreifen in diese Orte, ohne sie zu zerstören, meiner Meinung nach genau der richtige Weg, um eine Verbindung zwischen Vergangenheit, Gegenwart und Zukunft zu schaffen. 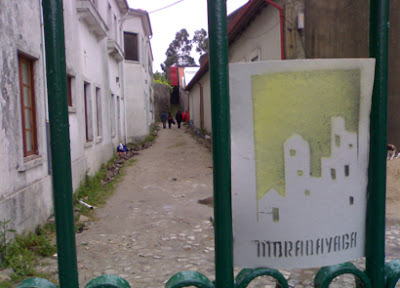 MV - What do you think the project "Moradavaga", which is basically trying to intervent temorarily in "vague spaces" of a city- or countrystructure? JE - Especially in a country like Portugal, which contains a lot of these "moradas vagas" and which is very connected to transitoriness, i think it's important to cope with these places and reanimate them. "Moradavaga" is doing this in a creative and not in an industrial way, which is something that I appreciate. As I think these traces of transitoriness are absolutely important for creating the charme of a city or a whole country this gentle intervention without destruction seems to be exactly the right way to build a connection between past, present and future. Josseline Engeler, geb. 28.09.1982, seit 2003 Studentin der Freien Kunst an der „Muthesius Hochschule für Kunst und Gestaltung“, Kiel. Seit 2004 Studium in der Fachklasse für Freie Kunst und Keramik bei Professorin Kerstin Abraham. Von September 2006 bis September 2007 Erasmusstipendium an der „Faculdade de Belas Artes do Porto“. Von 2003 bis heute Teilnahme an mehreren Ausstellungen, u.a. "Moradavaga" 2006, Porto. Josseline Engeler, born 1982/09/28, since 2003 student of Fine Arts at "Muthesius Hochschule für Kunst und Gestaltung", Kiel. Since 2004 masterclass for Fine Arts and Ceramics of Kerstin Abraham. From september 2006 until september 2007 Erasmus-scholarship at "Faculdade de Belas Artes do Porto". Since 2003 until today participation in several exhibitions, f.e. "Moradavaga" 2006, Porto. MV – De que pressupostos partiram para a realização da vossa proposta apresentada ao/no concurso de ideias lançado pela MORADAVAGA? Como surgiu esta ideia? JC + BB - A ideia base era a utilização do espaço público para fins que nos dessem prazer... que aquele servisse para alguma coisa sem ser só para passar, como muitas vezes sucede... que as pessoas pudessem usufruir de um espaço que muitas vezes é tido como de ninguém quando deveria ser entendido, pelo contrário, como um espaço de todos.No que se refere à utilização do livro como veículo para o usufruto de espaços ao ar livre na cidade, esta questão partiu do entendimento do mesmo como algo que não precisa de tanto empenho por parte do leitor ou tempo como por vezes se quer fazer crer... foi também porque era algo próximo de nós, de que gostamos. Desejávamos também torná-lo facilmente acessível a toda a gente de maneira a ajudar a libertar a imaginação de cada um...O objecto “livro” tem várias utilizações possíveis e esta iniciativa desenvolveu-se um pouco à volta da exploração desta ideia: tens a leitura de um romance, que implica uma leitura mais demorada que exige uma elevada concentração, ou apenas a fruição de uma ilustração ou de um pequeno texto de informação, a leitura de um poema, ou a apreciação das próprias características físicas do objecto como a paginação ou os pormenores tipográficos, etc. MV - On what grounds did you build up the proposal that you presented in the ideas competition launched by Moradavaga? How did you come up with that idea? 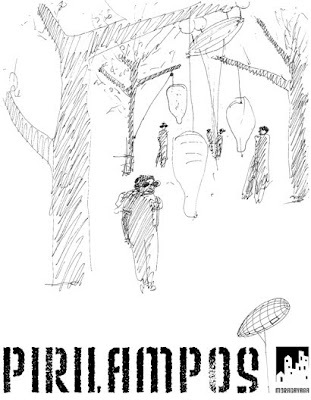 JC + BB – The main idea was based on using public spaces in ways that would be pleasant to us... that the public space should be something more than just a place you pass by on your way to somewhere else...that people could enjoy places that are commonly seen as “no man’s land” when, on the contrary, they should be perceived as “places of everyone”. Regarding the use of the book as a vehicle for the enjoyment of open air spaces in the city, that happened because books are something that we enjoy and we think that reading a book doesn’t necessarily need such a commitment from the reader, as many people seem to believe… We also wished to make them easily accessible to everyone to help people free their imagination. You may use and enjoy a book in various different ways and our project explored this idea: you can read a novel that catches your full attention and spend some time doing it, or you can simply enjoy a picture or a illustration, or be interested in a small text or a poem, or be delighted with the object itself, with the way that it’s printed, the quality of the materials used in its production, the typographic solutions it makes use of, etcetera. MV – Como refere o título do vosso projecto, havia quatro pernas (as vossas! 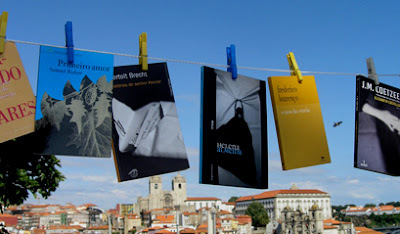 ), muitos olhos (os dos transeuntes) e cerca de quatro dezenas de livros. Como é que se processou a vossa iniciativa? JC + BB – No que toca à selecção dos livros, esta tentou ser o mais variada possível. 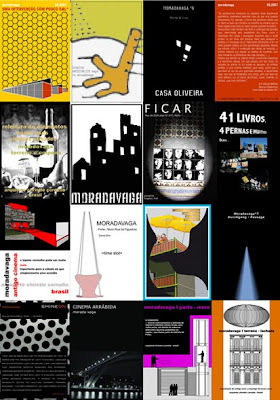 Havia romances, poesia, ensaios, livros infantis, monografias sobre diferentes artistas, pintores, fotógrafos, escultores, livros de fantasia, ficção, livros de contos... livros de várias dimensões, pequenos, médios, grandes, finos, mais grossos, de capa mole e capa dura... Isto tudo para ir ao encontro daquilo que as pessoas pudessem gostar, o que no fundo ia também ao encontro dessas várias facetas de que um livro se pode revestir de que falávamos anteriormente.Para além dos livros tínhamos lápis de cor, papéis e fita adesiva para qualquer “eventualidade”, ou seja, estávamos preparadas para a possibilidade de aparecerem crianças e de, portanto, poder explorar algumas das histórias através do recurso ao desenho, ao recorte ou à colagem. Aliás, no segundo espaço pelo qual passámos/que visitámos, isso veio efectivamente a acontecer.Num pequeno baldio de onde habitualmente se aprecia o tradicional fogo de artifício nas festas de S. João, surgiram algumas crianças que nós convidámos para ouvir uma história...e aquele momento foi o que levou a mais actividades: um grupo de cinco crianças ficou a ouvir-nos ler uma história e, ao mesmo tempo, nós íamos puxando por elas e elas iam interpretando a história através de desenhos, inventaram histórias a partir daquela que ouviram...isto ainda durou algum tempo. MV – As the title of your project indicates, there were four legs (your own! ), many eyes (those of the passers by) and around forty books. How did it worked? JC +BB – We tried to select a wide variety of books. There were novels, poetry, essays, storybooks, artist’s monographs, fiction, tales… small books, big books, medium sized books, hardcover and paperbacks… We tried to provide the readers with a considerable range of choices and also to express that multitude of elements that a book may contain in it. MV – Em que outros sítios é que “actuaram”?/intervieram? JC + BB – Começámos pelo Passeio das Virtudes, depois fomos para o já referido baldio ao fundo da Rua de S. Bento da Vitória e, por último, passámos pelo jardim do Marquês. MV – In which other places did you intervene? JC + BB – We started on Passeio das Virtudes and then went to the vacant plot at the end of Rua de S. Bento da Vitória that we talked about. After that we still had the time to go to Praça do Marquês. MV – Quais foram as razões por trás da escolha desses sítios? MV – What were the reasons for choosing those places? MV – O sistema que encontraram para expor os livros é deveras insólito! Como é que chegaram àquela solução de os apresentar às pessoas, assim, pendurados?/ How did you come up with the idea of hanging the books? JC + BB – Porque os estendais com roupa pendurada constituem, em nosso entender, uma das imagens fortes da cidade do Porto. Agrada-nos a espontaneidade da roupa pendurada, muitas vezes em espaço comum, público, de uma forma muito natural... E os livros, à semelhança das roupas, são muito coloridos, muito variados, e, como nós pretendíamos que a nossa iniciativa se pautasse pela simplicidade e pela naturalidade, optámos por este processo, algo poético, de apresentá-los às pessoas. MV – The way you presented the books was particularly clever! How did you come up with the idea of hanging them on a rope? JC + BB – In our view, the image of clothes hanged to dry in the streets and in the facades of the buildings are one of the trade marks of Porto’s old neighbourhoods. We like the spontaneity of people hanging clothes in the public space, in a very natural way… Books, like clothes, are colourful and vary in size, and, as we wanted our project to be very simple and natural and to use as few resources as we could, we decided to use this technique in a somewhat poetic way. MV – Poder-se-á inferir, do que disseram até agora, que aquilo que vocês defendem é que os espaços e as pessoas estão “lá” e o que é necessário é fornecer/providenciar funções de “animação”? JC + BB – Funções prazenteiras... que dêem prazer, para que as pessoas não passem apenas, para que lhes seja dada oportunidade de permanecer. Neste caso foram livros, mas poderiam ser outras coisas... aquele projecto “se esta rua fosse minha...” foi fantástico! Seria de repetir, principalmente em dias de sol!Há uma geração de pessoas mais velhas que ainda vai utilizando os espaços, reúnem-se, jogam às cartas... algumas crianças também, mas cada vez menos. De resto, pouca gente de idades intermédias parece utilizar a rua... embora agora, com a nova lei do tabaco, se note que começa a acontecer uma maior utilização das ruas... (risos)Se os espaços fossem tornados mais convidativos... Ou seja, não queremos de maneira alguma defender que a responsabilidade para tornar os espaços públicos agradáveis é unicamente das pessoas. As câmaras municipais têm um papel muito importante, tanto na qualidade dos espaços, como no apoio a iniciativas de animação das ruas.O Marquês, por exemplo, era um espaço escuro e desconfortável, mas desde a intervenção para instalação do Metro há famílias que passeiam descansadamente às onze da noite! Ao invés, a Praça dos Poveiros é um deserto... ou a rotunda da Boavista que é um espaço com potencial mas que não tem funções atraentes... serve só de passagem.Mas acreditamos também que as pessoas podem apropriar-se do espaço e utilizá-lo de maneiras muito diversas. A partir do momento em que o espaço é percebido como sendo de todos pensamos que as coisas mudam de figura... como o caso das crianças que jogam e brincam em frente ao Centro Português de Fotografia, apropriando-se espontaneamente do espaço. MV – May one infer, from what you’ve said until now, that what you believe is that the people and the spaces are there and that it’s just necessary to provide some kind of activity or function to make it happen? JC + BB – Pleasant activities… ones that are pleasurable so that people don’t just pass through but also feel compelled to remain in a public place. In this case it was the books, but it could have been something else… the event “se esta rua fosse minha…” (“if this street was mine…”) was fantastic! There should be more of that kind, especially in sunny days! Maybe if the places were more inviting… with this we’re trying to say that the responsibility of transforming these spaces doesn’t lie only on the people’s side. The public authorities have a major role in the design of the spaces as well as in supporting their animation. Marquês, for example, was a dark and uncomfortable place but nowadays, since the intervention of the Metro, there are families that walk around at 11p.m.! On the other hand, Praça dos Poveiros is a desert… or Rotunda da Boavista, which is a space with lots of potential but that has no attractive functions… only a place to pass by. Nevertheless we believe that people have the possibility of using the space in multiple ways. If people would see the public space as belonging to everyone, we would start to think in a different way… one example would be the kids playing soccer in front of Centro Português de Fotografia – they had putt beacons! – appropriating the space spontaneously. MV – Gostaram do resultado da vossa iniciativa? MV – Did you like the results of your work? JC + BB – We were very excited when we finished the project. The kids and the rest of the people, they were great! It was really cool! MV – De que meios é que necessitariam para implementar algo deste género? MV – What kind of means would you need to have to implement something similar? JC + BB – To have more materials to be able to give them to people… in this project, we used our own books… we would like to give books to people, to the children… another idea that we could try in a newer initiative would be to encourage people to make their own books… one of the coolest parts of this project regards our own knowledge of the books that we were carrying. We then could explain and show them to people… I was thinking that we could do the same with music, share our knowledge, the things we like and explain why we like it… the same happens between friends, when we discover something new and we want to share it with them…. 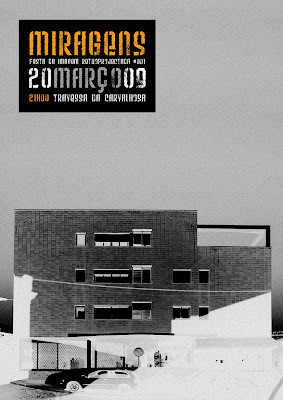 ...is a collective founded in the end of 2006 at the city of Porto in Portugal, that acts and reflects on the temporary use of vacant/vague spaces.